If you are interested in taking up surfing, but not ready to commit to buying yourself a surfboard, then consider the benefits of using an inflatable stand up paddle board for surfing. While not all iSUPs are good for riding waves, there are actually some great models out there that can go up against most surfboards. In general, with an inflatable SUP, you get good performance while riding waves thanks to the stiff and stable design of the paddle boards. You also get great maneuverability since turning a SUP is usually very easy to accomplish in the water. The important thing to remember when shopping for a surf iSUP is to look for a board that is good for wave riding and surfing as opposed to one that is designed for cruising or recreational paddling. While you can successfully use a cruiser iSUP in small waves, they are not all that great in bigger waves. In the past I’ve reviewed the Naish Mana Air iSUP and noted that the 11.6-ft version is one of the best that I’ve found for iSUP surfing. However, I’ve since become a big fan of the Boardworks Kraken SUP listed above. Generally speaking though, shorter boards are better in bigger waves. Though I do suggest that you seriously consider the Naish Mana Air and the Boardworks Kraken for your paddle board surfing needs, I also want to highlight some of the other top boards that I’ve found. While a shorter SUP size is deal for most people, do remember that each person is different and just like some surfers prefer longboards, some SUPers will also prefer longer SUPs. For that reason, I’ll be highlighting both long and short iSUPS that perform well in the waves. This is the classic line of surf-inspired EPS foam SUPs that BIC makes. 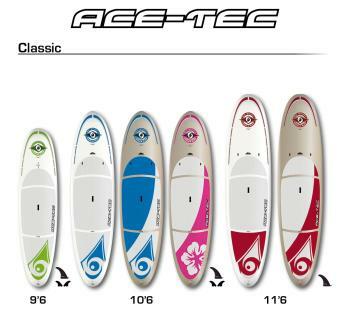 They are designed with versatility in mind so that you can use them for cruising as well as surfing. To get more stability in the waves, just change up from a single center fin to two side fins and you are ready to surf those waves. 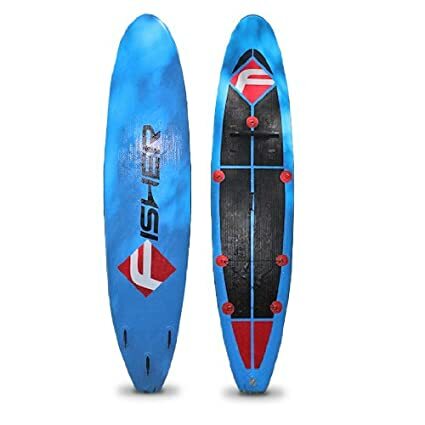 This is an ultra durable board that will give you plenty of years of enjoyment in the water. And, it has a pretty decent price. Note that this SUP does not come with a leash or a paddle, so that is an extra cost that you’ll need to budget in when considering how much this will cost you. As you can see in the image, you can choose from several different color choices as well as a few different board size options. However, we think that the Bic BIC Sport ACE-TEC Performer 11′ 6″ Stand Up Paddle Board is the best SUP for small wave surfing. For the sizes, you should go with the SUP that best fits your body weight as you do not want to get one that cannot handle supporting you out in the water. One of the things that I think you’ll notice as soon as you get this board out on the water is that it gives you a better glide than your average cruising SUP. That what makes it so good for surfing. My only real complaint with this board is one that a lot of paddle boarders echo – along the side there is a very rough seam that will rough up your skin if you fall against it. BIC’s suggestion is to use a sander to sand it down so that it’s not a problem. Personally, I don’t see why they can’t do this before it leaves their warehouse. So, just something to keep in mind as you compare this iSUP to other surfing SUP options. Another good option that has an affordable price is this iSUP by Fisher Aria. It is available in this one size and packs a lot of punch. It is a very versatile board that just happens to be great for surfing. Plus, it has a great price. As you can see, the iSUP has a classic surfboard design, which is one of the reasons that it glides so well in the waves. Do note that this iSUP does not come with a paddle, so you’ll need to purchase one of those separately (as well as a paddle leash, if you’re interested in one of those). I like that this iSUP is ultra durable and that you get added stability from it since you can actually pump it up to 14 PSI, which is a lot higher than most SUPs. It also has high pressure military spring valves, which means that inflation and deflation and slightly quicker than other inflatable stand up paddleboards that I’ve tried. The surface has a EVA grip pad, so that means you don’t have to worry about traction. It keeps you where you want to be and does so comfortably. It also has D-rings for easy storage of the water bottle, your paddle leash or other items. 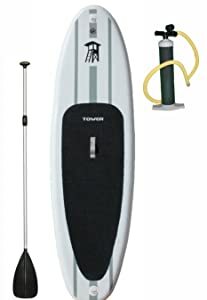 A few months ago, I reviewed the Tower Adventurer 9’10″ inflatable stand up paddle board and mentioned how much I love it. It is truly a great value iSUP that gives you a lot of great features and included items at a good price. I don’t want to repeat everything that I’ve already said about this iSUP, so I do suggest that you check out my original review on the site here. Like the Fisher Aria, this SUP from Tower Paddle Boards gives you a lot of versatility for the money. It maneuvers well in waves, is great for recreational paddling and is even good for SUP yoga. One thing to note, however, is that while the Tower Adventurer does come with a paddle, you will still need to purchase one for surfing. Why? Because although it is a decent paddle, it will rust in the salt water and it does NOT float, so you can easily lose it to the ocean floor. Overall, this is a good, cheap option for iSUP surfing with the added bonus of versatility. If you are trying to decide between this model and the Fisher Aria, then consider the difference in the board length and the kayak options with the Aria to help come to a final decision on the best iSUP surfing board for your individual needs. Please note that these models are by no means all of the SUPs that can be used for surfing. Instead, these are only the models that I, personally, have found that perform well in the waves.